Although over a century old, Belle Époque style hasn’t lost its appeal. This Belle Époque-inspired jewelry piece was a recent custom request for a wedding present. 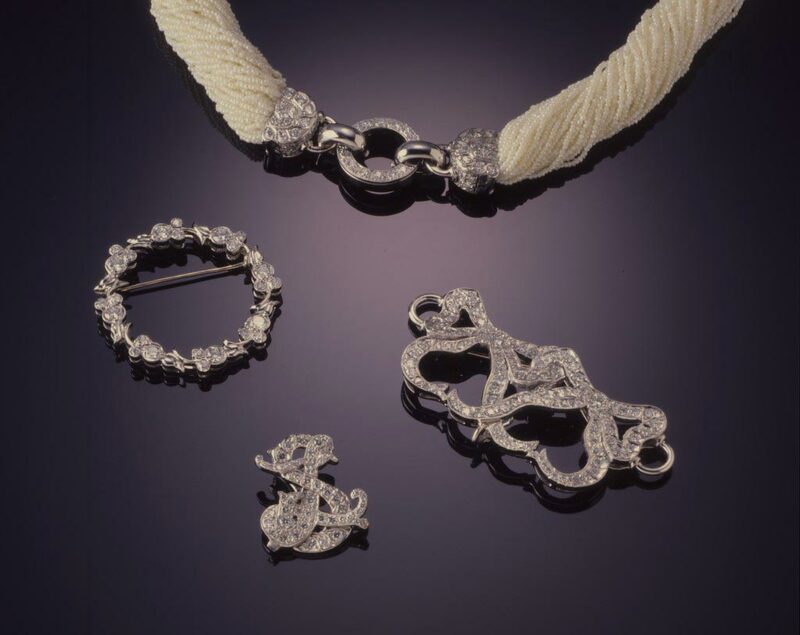 This multi-use, hand-fabricated platinum and diamond set features a 100 strand (over 10,000 piece) Keishi pearl necklace. © J. Grahl Design. Used with permission. What was the Belle Époque? The Belle Époque (1890-1915) encompassed three jewelry design periods: Art Nouveau, the Arts and Crafts movement, and Edwardian. The “Beautiful Era” was a time of increasing wealth and flourishing arts. When cinema boomed, movie stars, instead of European royalty, became trendsetters. As a result, Hollywood (and America) emerged as the ones to watch. Belle Époque jewelry included machine created as well as handcrafted pieces. However, the Arts and Crafts movement was a response against the use of machines. Thus, Arts and Crafts jewelry was all hand-fabricated. This design period was brief due to incredibly labor-intensive techniques, which made the jewelry too expensive. Cultured pearls appeared on the scene and were often used in Belle Époque jewelry in addition to natural freshwater and saltwater pearls. 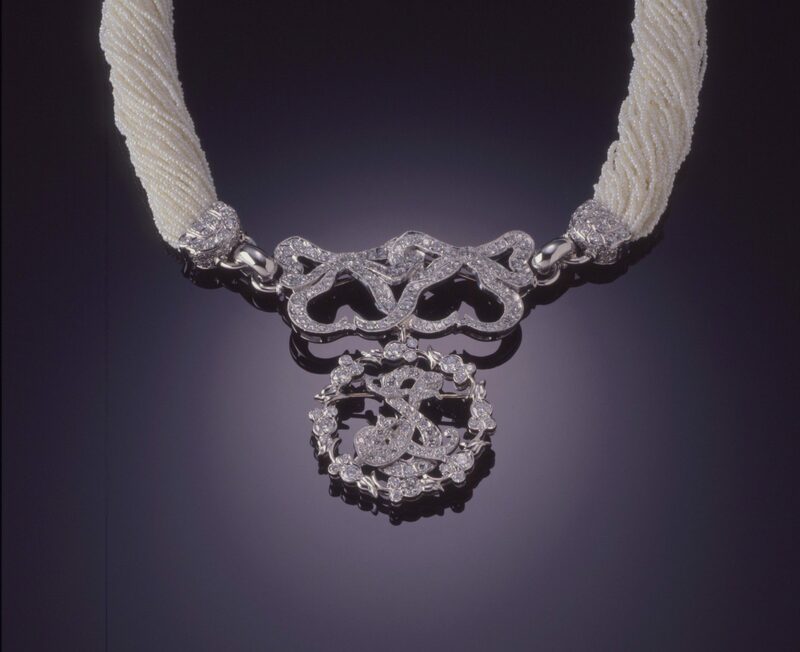 Chokers, like this one, were popular fashion accessories in the Belle Époque period. The centerpiece is comprised of old mine-cut and rose-cut diamonds weighing a total of 1.55 carats. The setting is crafted from silver over rose gold. 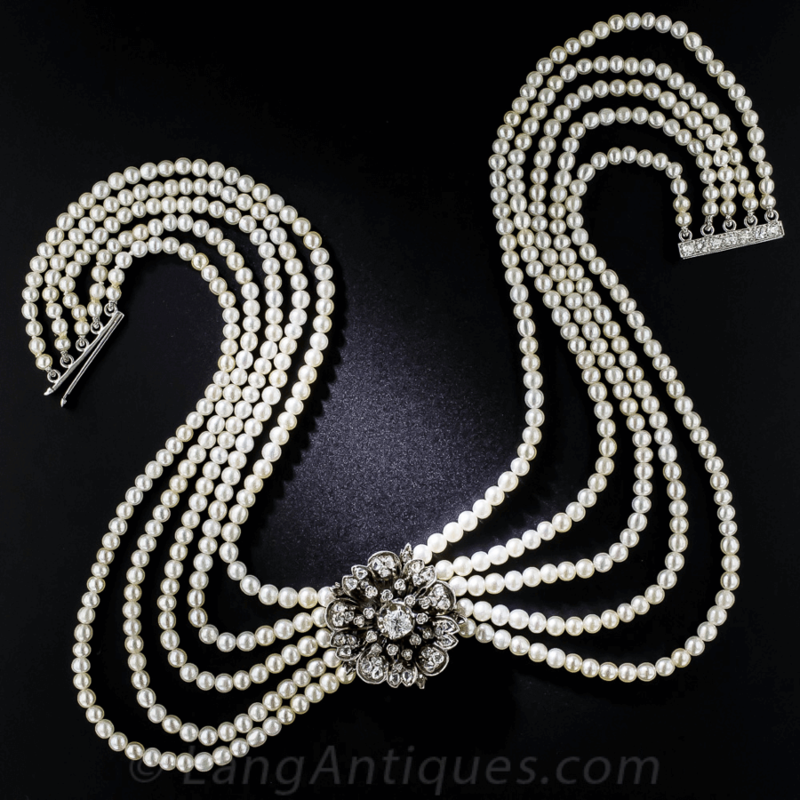 A platinum and diamond clasp attaches the strands of cultured pearls that measure 13”. This choker sells for $4,750. Photograph by Cole Bybee. Image courtesy of Lang Antique and Estate Jewelry. Jewelry makers of the Art Nouveau period strived to capture the movement of nature in wearable works of art. The jewelry designs seemed to come straight from paintings or the natural environment. Fluid lines and asymmetrical patterns were common motifs. Female forms and nature scenes, including flowers, insects, lizards, and snakes, often graced jewelry pieces from this period. Jewelry makers commonly used gold, silver, and platinum. 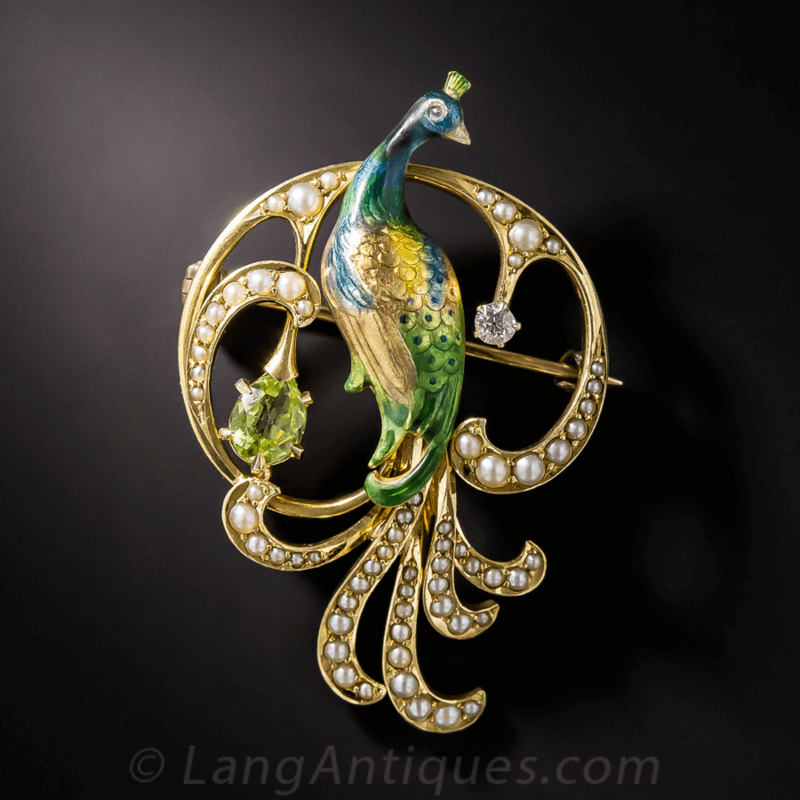 This Art Nouveau pin features multi-colored enameling on the peacock surrounded by 62 seed pearls. Accenting the pin is one 0.6 carat peridot and one 0.06 carat old European-cut diamond. The pin was made by Krementz, a storied American jewelry company, which adds to its value. The pin is 18k yellow gold. Photograph by Cole Bybee. Image courtesy of Lang Antique and Estate Jewelry. 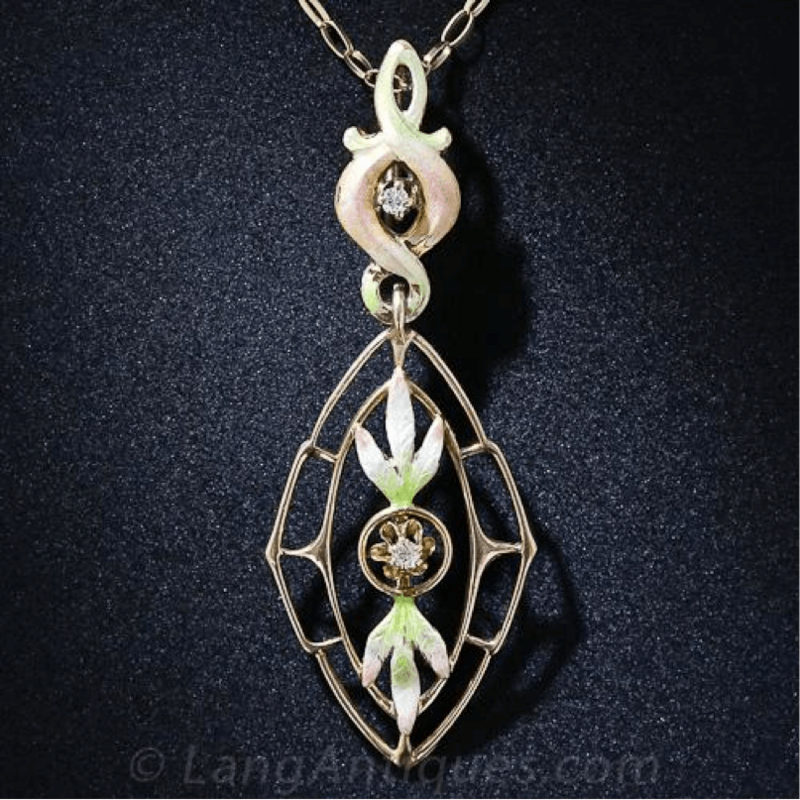 Plique-a-jour enameling (used extensively by Art Nouveau designer Rene Lalique) was similar to stained glass windows, with the enameling webbed between thin metal walls with no backing. Cloisonné enameling had metal walls and a backing to contain the enameling. Basse-taille enameling involved depressions hollowed out in the metal with the enameling filling the entire piece. 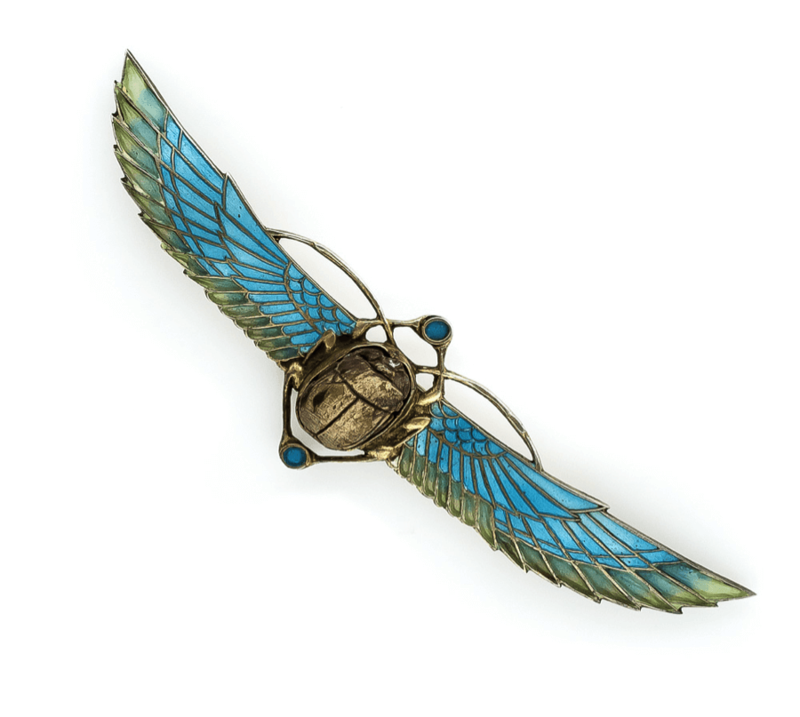 This Art Nouveau Egyptian motif scarab beetle pin displays plique-a-jour enameling and is fashioned from silver overlaid with gold. The condition of the enameling is extremely important in pricing jewelry from this period. The enameling in this brooch is in excellent condition with no chips or cracks. Photograph by Cole Bybee. Image courtesy of Lang Antique and Estate Jewelry. The gem materials most popular during the Art Nouveau were amber, celluloid (plastic), chrysoberyl, crystal glass, demantoid garnet, horn, malachite, moonstone, opal, tortoise shell, and tourmaline. 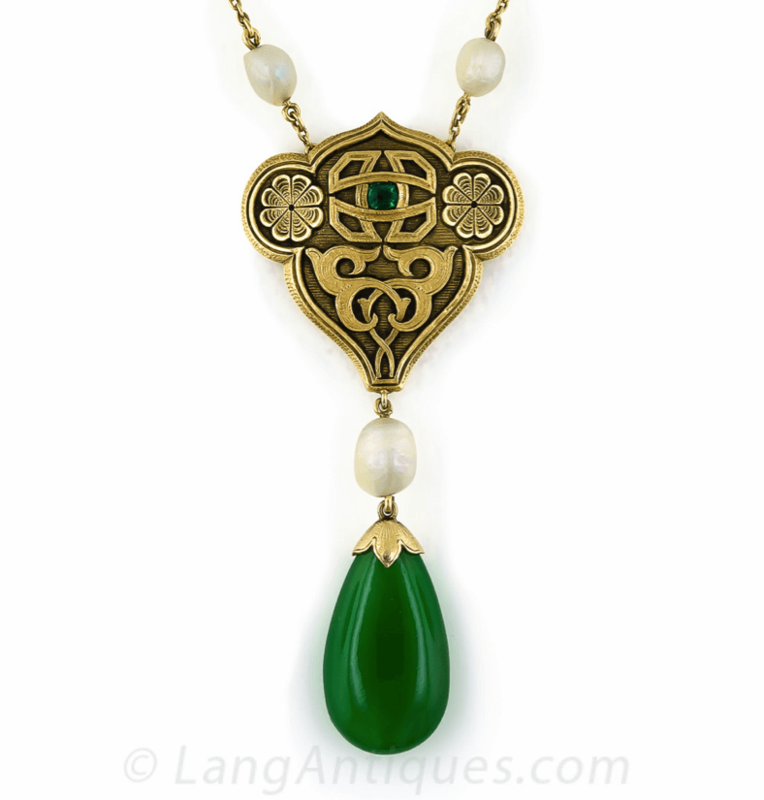 This Arts and Crafts pendant features an Asian motif and a huge drop of jadeite accented with seed pearls and a 0.1 carat emerald. The hand-fabrication and intricate metalwork are eye-catching. The jadeite is magnificent. The necklace is 9k yellow gold. Photograph by Cole Bybee. Image courtesy of Lang Antique and Estate Jewelry. The jewelry created in this style was an attempt to reclaim art from the machine. However, this return to the old ways was short-lived and not very popular. Arts and Crafts jewelry pieces featured very simple designs. The intricacy of the metalwork was the focal point. Semi-precious gems, non-precious metals, and enameling were commonly used. This delicate lavaliere pendant features pastel enameling and two old mine-cut diamonds weighing 0.05 carats. Notice how the artistry of the piece rather than glittering gemstones captures the attention. Photograph by Cole Bybee. Image courtesy of Lang Antique and Estate Jewelry. The Edwardian period covered the reign of King Edward of Great Britain and his trendsetting queen, Alexandra. The jewelry from this period was very light and delicate. Diamonds took center stage, while colored gemstones played supporting roles. Some of the most popular included amethyst, aquamarine, emerald, garnet, moonstone, opal, pearl, peridot, ruby, and sapphire. 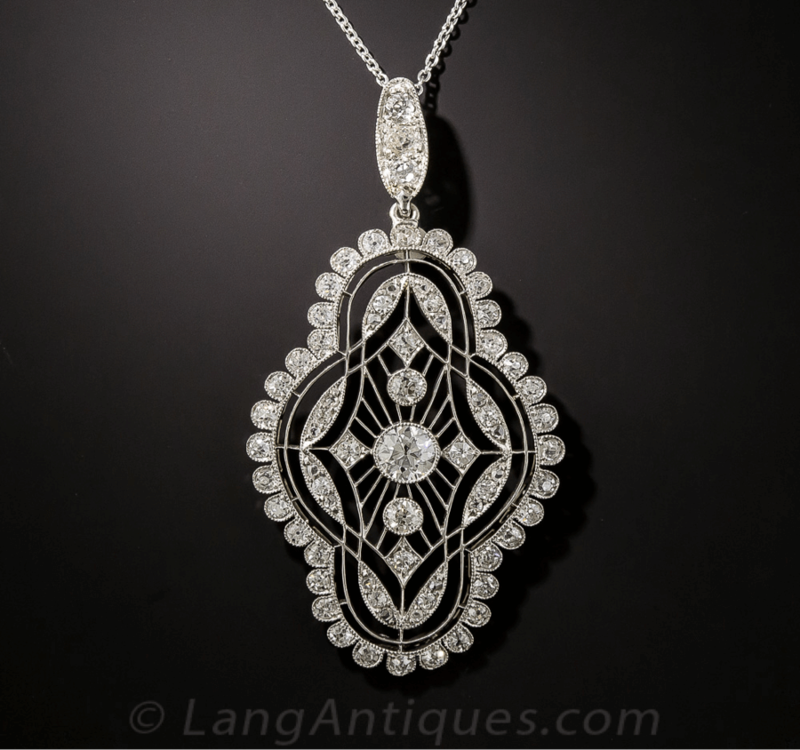 This Edwardian pendant features old mine-cut and single-cut diamonds weighing a total of 1.90 carats in delicate but strong platinum settings. The center diamond is a 0.45 carat old European-cut diamond. Photograph by Cole Bybee. Image courtesy of Lang Antique and Estate Jewelry. Platinum dominated as a jewelry metal. The strength of platinum, in particular, played an important role in Edwardian jewelry making. Thin bridges of platinum created delicate and lacy designs scattered with gemstones held tightly in place by the strong metal. In addition, jewelry makers frequently used rolled gold, multi-colored gold, and silver. The Japanese art of enameling was a prominent feature in the Belle Époque jewelry of this time. Common motifs were bows, crescent moons with stars, flowers, horseshoes, shamrocks, sporting themes, and wishbones. 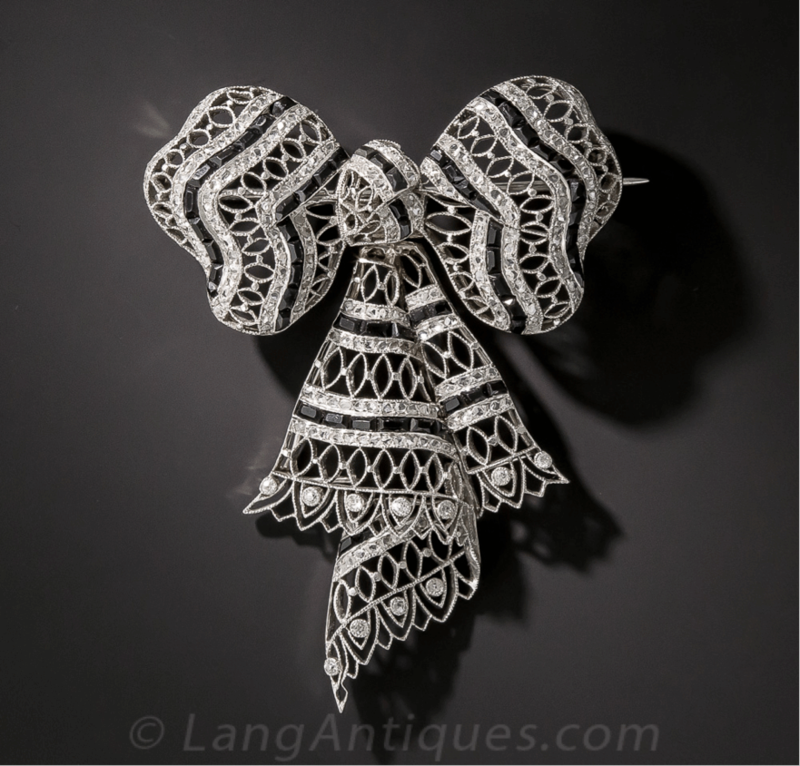 This beautiful platinum brooch features the popular Edwardian bow motif and exemplifies the intricate laciness of Belle Époque jewelry from this period. The bow features rose-cut and old mine-cut diamonds weighing a total of 1.00 carat. Ribbons of 59 calibre-cut onyx accent the diamonds. The diamond weight is substantial, but the artistry of the design steals the show. Photograph by Cole Bybee. Image courtesy of Lang Antique and Estate Jewelry. Dog Collars: elaborate choker-style necklaces. Sautoir: a long, roped necklace that ended with a tassel. 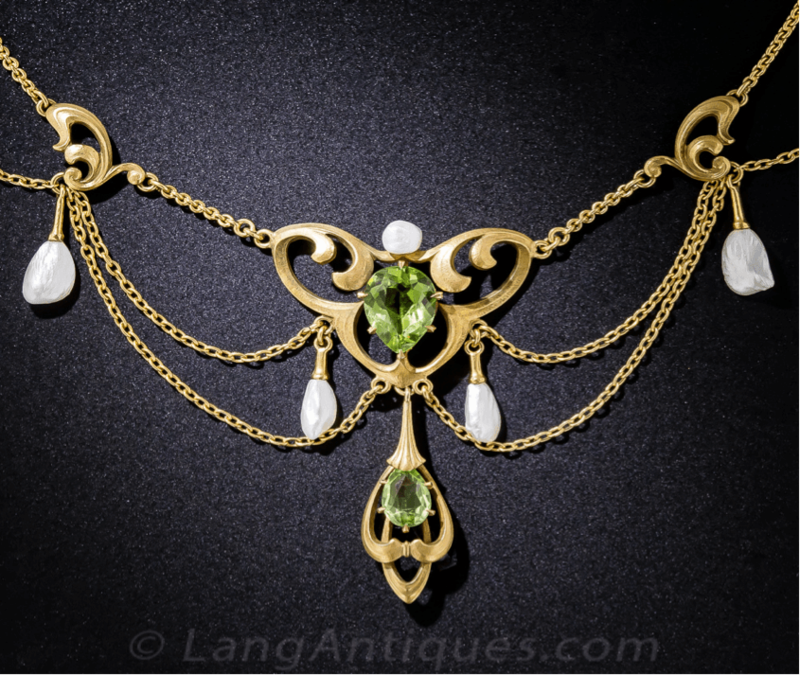 This festoon necklace features two peridots, weighing a total of 2.75 carats. Accenting the piece are seven freshwater pearls. The pendant is 16k yellow gold, while the chain is 18k yellow gold. The semi-precious gemstones and the graceful, draped style is classic Art Nouveau. Photograph by Cole Bybee. Image courtesy of Lang Antique and Estate Jewelry. Old Mine Cut: a rounded, square shape with many facets that closely resembles today’s modern round brilliant cut. Cabochon: a rounded top and flat bottom. Old European Cut: a round, faceted shape, a precursor to today’s modern round brilliant cut. The carnage of World War I halted the artistry and opulence of Belle Époque jewelry. Instead of jewelry, the world became focused on fighting a war and wishing brave young men safely home. Nevertheless, the designs of that time period continue to inspire the creations of jewelry makers to this day, and the jewelry pieces from that bygone era are highly-prized treasures. This custom jewelry piece disassembles to create a simple monogram pin, which can then be embellished with an additional diamond surround. Then, in turn, it can be hung from the bow, a favorite motif of Belle Époque jewelry, which is itself a pin that can be worn individually. A circle diamond center joins the pearl necklace, so it can be worn alone or with an additional piece suspended below. © J. Grahl Design. Used with permission.